The Zhoushan Archipelago in the East China Sea calls to mind Mount Putuoshan, one of China's four sacred mountains and pilgrimmage sites. A kingdom of Buddhism where Guan Yin, the Goddess of Mercy, is worshipped by millions, the island is already a landmark, a tourist staple. However, Western expats and holiday goers from nearby cities such as Shanghai, Hangzhou and elsewhere may not spend much time on worship. Fortunately, the archipelago also contains some undiscovered and unspoiled pleasures on other easily accessible islands that can be explored. Some are just a 10-minute boat ride from Putuoshan. This was an entirely different experience. Variable seascapes, lush woods, golden beaches, sheer rock cliffs, rock formations that beckon your imagination, "dragon's pearl' rocks, hidden wooden huts, wonderful seafood and fanciful fishes -- these were some keywords for my journey to islands other than Putuoshan. While flights for Zhoushan are available from Shanghai's Hongqiao Airport all year around, I chose bus and ferry service from Nanpu Bridge. It is cheaper. A one-way ticket cost a little over 100 yuan (US$12.70) and takes about four hours, much faster than direct coach, which takes six and a half hours. The bonus of coach and ferry is that you can experience the East Sea Bridge and Yangshan Deep-Water Port en route because the boat sails from that port. Traveling at more than 30 knots, the fiberglass fast boat was swift and comfortable. It would have been better if the seats in the enclosed cabin had been elevated and offered a view of the seascape and islands. When the boat was about to arrive at her destination -- Sanjiang Wharf on Zhoushan Island, the sunset at sea was striking against the silhouettes of islands. Zhoushan Island is the largest island in the archipelago and China's fourth largest island. Mini-bus services are available from Sanjiang Wharf to Shenjiamen, a famous fishing port at the southeastern end of the island and the best gangway to explore the neighboring islands. Base yourself in the comfortable small city -- there are nice hotels along the five-kilometer waterside promenade. There are lots of neon lights and great potential, but no glamourous neoclassical buildings as on Shanghai's Bund. The waterfront of Shanjaimen has busy piers and wharfs, fleets of rusty but rigid fishing boats awaiting repairs, some blown in by typhoon. The most prominent feature of the waterfront is undoubtedly a continuous string of 68 outdoor or orange tented night seafood stands. Fully licensed, these food vendors boast home-made dishes using the freshest sea fish, crab, shrimp and shellfish, some just caught in coastal areas in the afternoon and displayed for your selection, such as long red, eel-like duck-billed fish. These port restaurants are major nightlife venues and banquets can last until 2am or 3am. Locals are fond of drinking local plum spirits, beer and, of course, bai jiu. Guitarists, other musicians, even a man with an intriguingly antique saxophone -- all licensed -- gathered to entertain the diners. They had to perform in an annual music and singing cmpetition to obtain their licenses. The Wonderful flavor of the dishes, the reds, blues, yellows of raw seafood and greens piled up around the chefs, the sweet and spontaneous voices of the singers -- all the tastes, colors, smells were mixed up with the endless sounds of the crashing waves overhead. The hustle and bustle of Shanghai was a world away. My next day's destination was Taohua Island, or Peach Blossom Island, which lies to the south. A fast ferry took about 20 minutes from Shenjiamen. Interestingly, the island got its name not from real peach trees but from naturally formed black patterns on local stones that resemble branches of peach blossoms. A local folk legend attributes the black patterns to the ink unintentionally spilled by a hermit in early Qin Dynasty, who had been ordered to practice alchemy on the island. The stones with the delicate branch patterns appear everywhere on the island. Islanders believe the stone imprints will bring luck in seeking love, for in Chinese lexicology, the words "peach blossoms" connotes romantic encounters. The island's east coast is most impressive. A virtually unspoiled golden beach lies empty, the waves calm, along a bay with the clearest water to be found in the area. Near the cliffs to the south where rocks tumble to the sea, lies Peach Blossom Village, which provides lodging in some well-made wooden cottages, set back among the trees, facing a lawn. There is also a quiet, shaded hotel. Walking on the plank way built on the cliffs and over the rocks near the sea, I enjoyed geographic and geologic wonders with my imagination. Locals gave rocks the name of lion, sea turtle or even the Goddess of Mercy. Indeed, at low tide, you could see the sea turtle and his shell. A naturally formed smooth rock ball, churned by the waves over thousands, maybe millions of years, was called the "East Sea Pearl" -- and I spontaneously worshipped the power of nature. Although it is not among the largest islands in the archipelago, Taohua Island is the highest. Anqi Peak, named after the Qin Dynasty hermit, rises to 539.7 meters. A theme park using the sets used for shooting some TV series based on martial art novelist Jin Yong's masterpieces is also worth a visit, especially if you are a fan. The name of the island coincides with the fictitious East Sea island that figures in his work. On the third day, I explored Zhujiajian Island, southeast of Zhoushan Island. No ferry is necessary as a new bridge links the two islands. If you fly from Shanghai, you will arrive at Zhoushan Airport on this island. Zhujiajian is a place of relaxation and romance. Four beaches stretch along the southeast coast. One of them is the venue for the annual Zhoushan International Sand Sculpture Festival. It was utter enjoyment walking through a pine wood with storytelling sculpture works hidden in it and later playing in the waves on a beach filled with giant award-winning sand pieces, such as Gulliver pinned down by the Lilliputians. 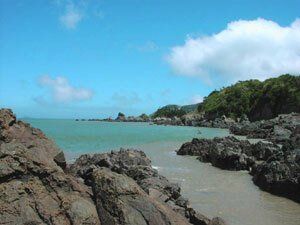 The island also features a very rare black pebble beach, which is located in a fishing-culture theme park. Replicas of ancient fishing boats were of some interest, especially their nickname "green eyebrows," derived from their colorful paint schemes. A car took me to the peak of the island, Mount Daqing at the southern end. Although its elevation at 378.6 meters is no match for Anqi Peak on Taohua Island, the panoramic view of all five beaches to the north was breathtaking. If I had time, I would have visited Dongji Island, the easternmost part of the Zhoushan archipelago. It is said to be the first place in China to greet sunrise every day. It is captivating not only because of the pure blue sea around it but also because of the sincerity and gallantry of the islanders who rescued many British soldiers in October 1942 from the stricken Japanese transport ship Lisbon Maru. The crew were ordered to drown the men after the Japanese ship had been torpedoed by the American submarine USS Grouper (SS-214). Local fisherfolk's art is characterized by bright colors and shapes, from ships and fish to fishermen. Island painters, mainly fishermen's wives, display their works, vividly depicting their daily lives in amazing colors and abstraction. The tourist bureau of Zhoushan City's Putuo district, which administers the islands of Taohua, Zhujiajian, Dongji and the port of Shenjiamen, will attend the China International Travel Mart 2006 in the Shanghai New International Expo Center from November 16-19. The fair will be open to the public from November 18.